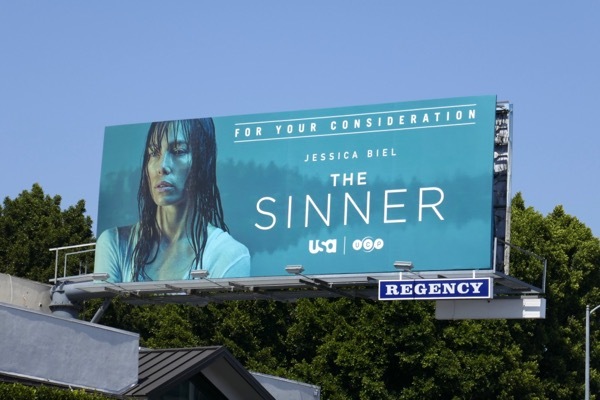 Over the past week here at Daily Billboard we've shared some of the Emmy consideration billboards from the big streaming platforms and broadcast networks, and today it's time to shine a spotlight on some of the other channels and their dramas and reality shows. 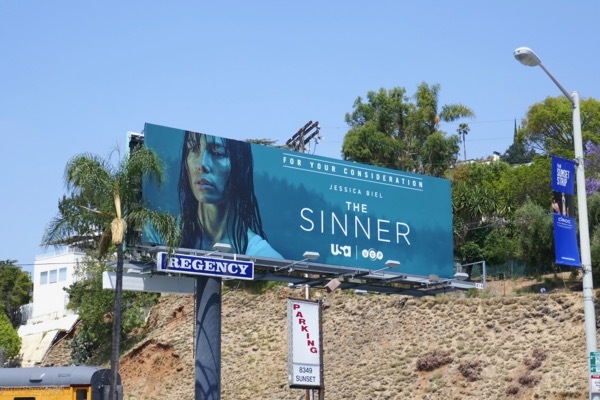 First up is USA Network with their critically-acclaimed summer hit limited series, The Sinner. Couched as a whydunit, rather than a whodunit, Jessica Biel stars in this episodic adaptation of Petra Hammesfahr's 2007 novel about a woman who stabs a man to death in broad daylight in front of dozens of witnesses, whilst Bill Pullman stars as a detective trying to unravel why she committed this violent homicide. 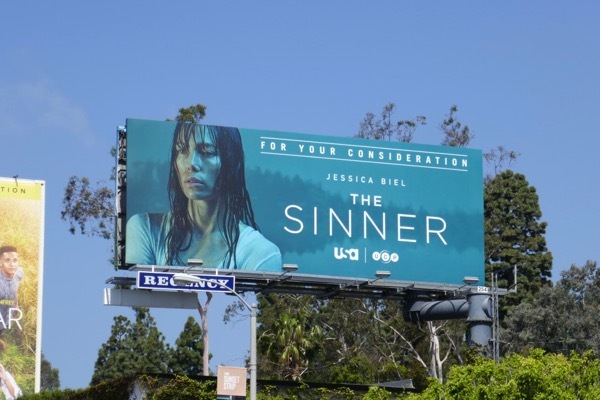 Already nominated for two Golden Globes, can this outdoor FYC campaign photographed along the Sunset Strip from June 1 to June 8, 2018, help The Sinner garner some Emmy nods this season. 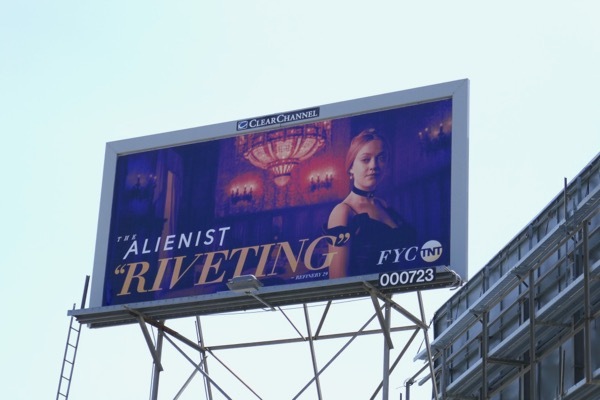 Meanwhile TNT is hoping their period mystery thriller, The Alienist, will receive some recognition from TV Academy voters. 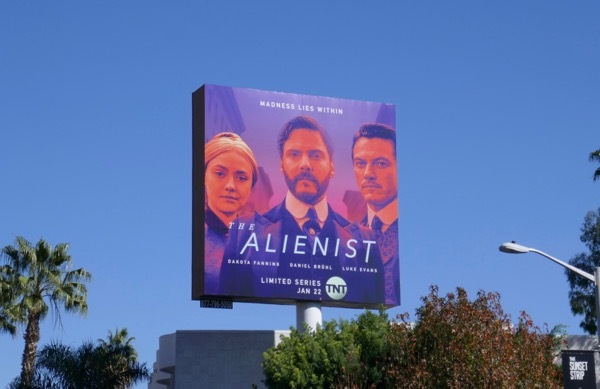 Set in late 19th century New York, a newly appointment police commissioner tasks criminal psychologist (aka alienist) 'Dr. Laslo Kreizler' (Daniel Brühl) and newspaper illustrator 'John Moore' (Luke Evans) with conducting a clandestine investigation into the gruesome murders of young male prostitutes. Joined in their quest by headstrong secretary 'Sarah Howard' (Dakota Fanning), who's determined to become the city's first female detective, the trio of outsiders employ early psychology and forensic techniques to track one to the first serial killers. 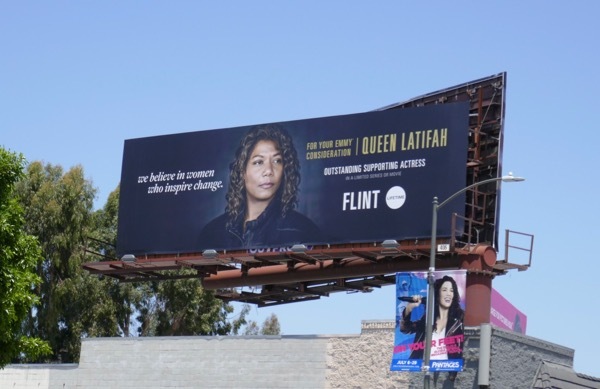 The vibrant series launch billboards were photographed along La Brea Avenue and the Sunset Strip from January 5 to January 23, 2018. 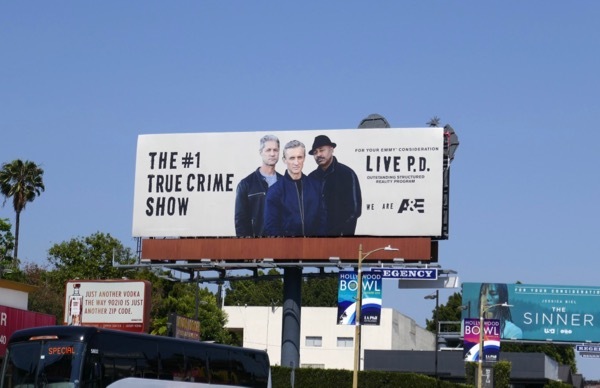 Meanwhile all these Emmy consideration billboards were spotted along Sunset Boulevard, Robertson Boulevard and La Cienega Boulevard from May 17 to June 7, 2018. 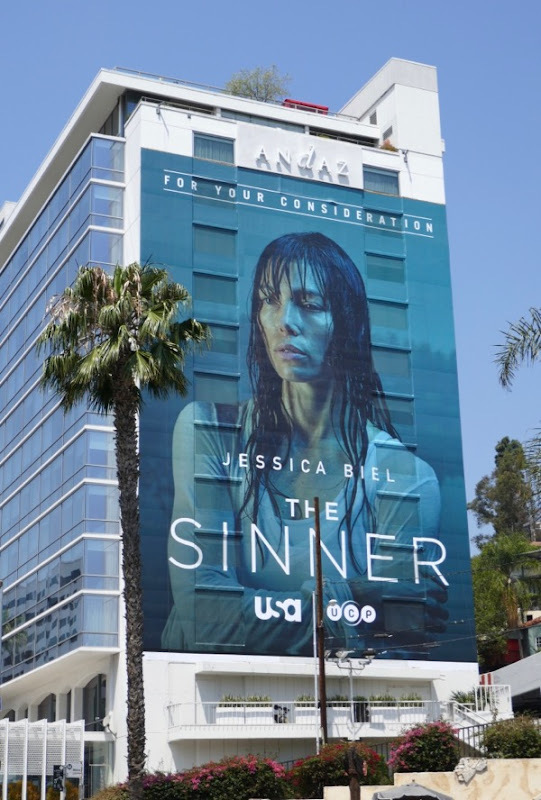 Can this Emmy campaign help this 'captivating', 'riveting' and 'superb' drama capture some Emmy attention for its television debut. 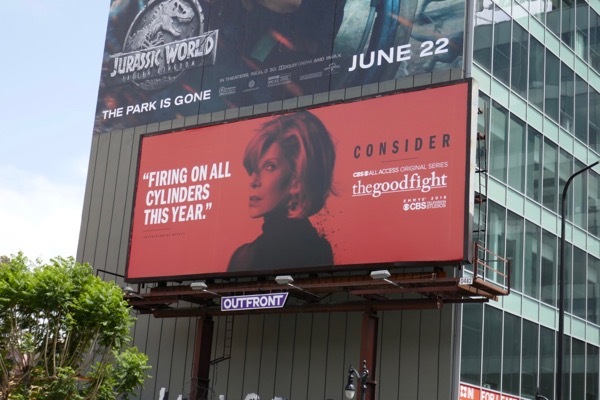 The colour keeps coming in the skies this month with these striking red billboards for the sophomore season of The Good Fight. 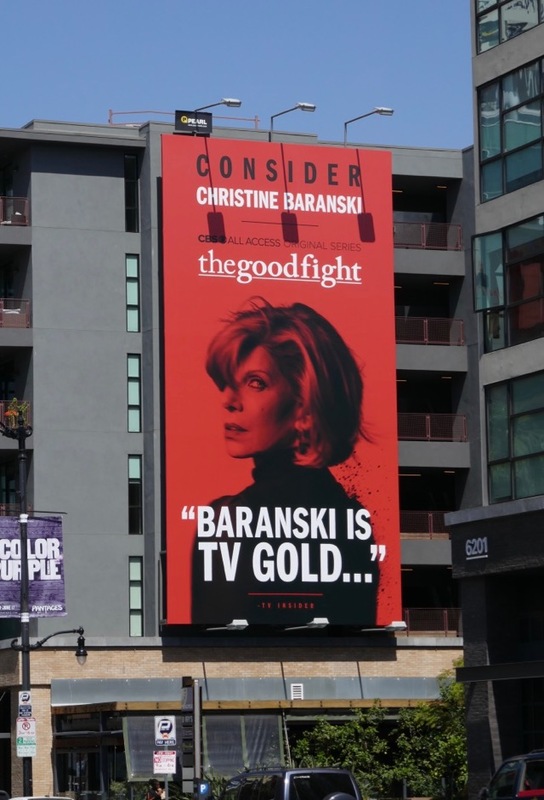 The original spin-off series of The Good Wife on CBS All Access continues to follow the personal, political and legal trials and tribulations of Christine Baranski's 'Diane Lockhart' and her fellow lawyers played by Cush Jumbo, Rose Leslie and Delroy Lindo. 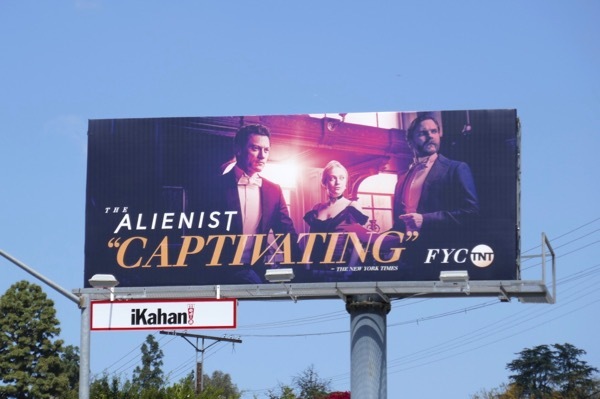 These bold Emmy FYC billboards using the key art from the second season were snapped along Highland Avenue and Hollywood Boulevard from June 4 to June 8, 2018. 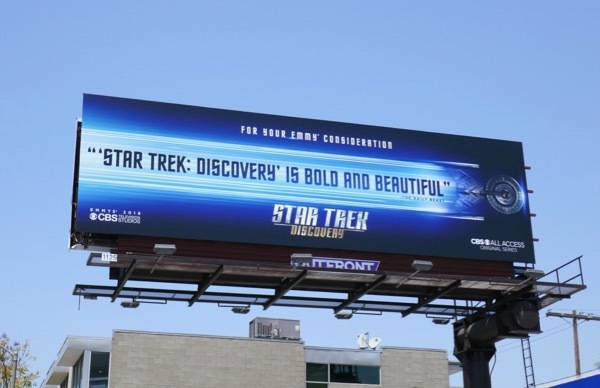 Also streaming on the new CBS subscription platform and hoping for some consideration are the new sci-fi adventures of Star Trek: Discovery. 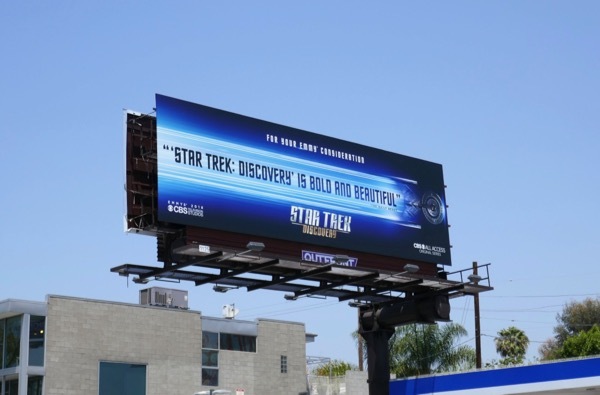 Can the television series starring The Walking Dead's Sonequa Martin-Green convince Emmy voters that its boldly gone where no Star Trek show has gone before with this FYC billboard spied along Melrose Avenue on June 7, 2018. 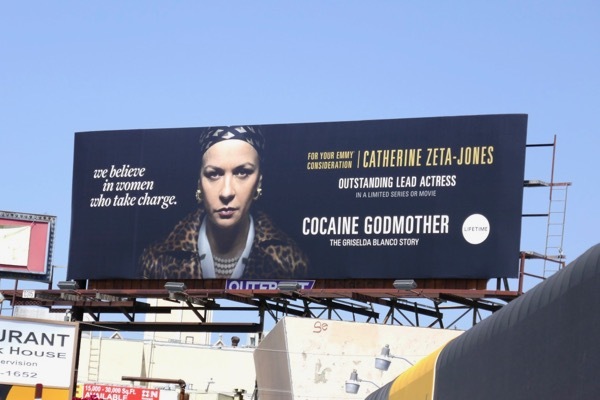 Strong women were also taking charge on Lifetime this year with Catherine Zeta-Jones playing the Cocaine Godmother in The Griselda Blanco Story, chronicling her life as a Colombian drug lord and mastermind of over 200 murders. 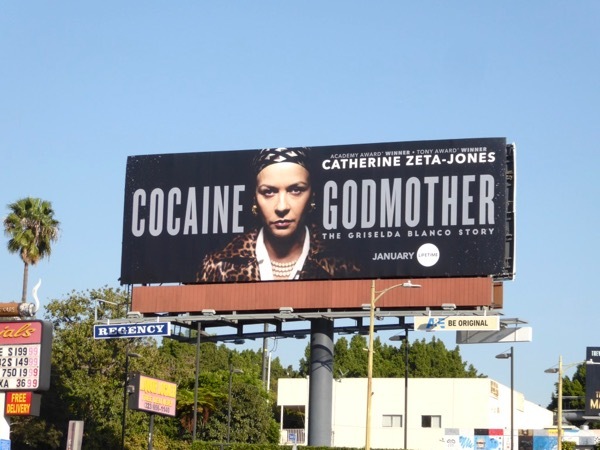 This original telemovie launch billboard was spotted along Sunset Boulevard on December 19, 2017, whilst the Emmy consideration billboard was captured along Pico Boulevard on June 1, 2018. 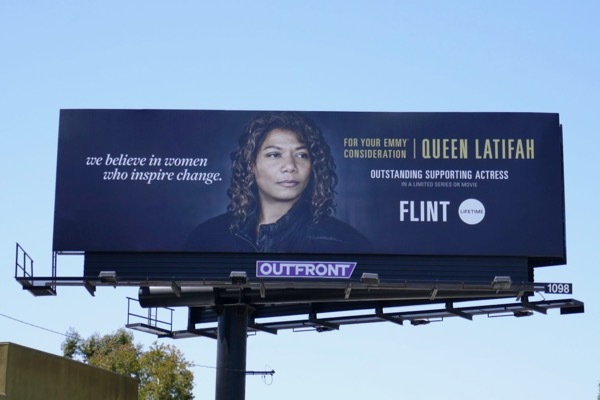 Lifetime was also shining a spotlight on Queen Latifah this month for her role in the TV movie about the real-life Flint water crisis in Michigan, where over 100,000 residents were exposed to high levels of lead in their drinking water supply and still have to rely on bottled and filtered water for drinking, cooking and bathing. 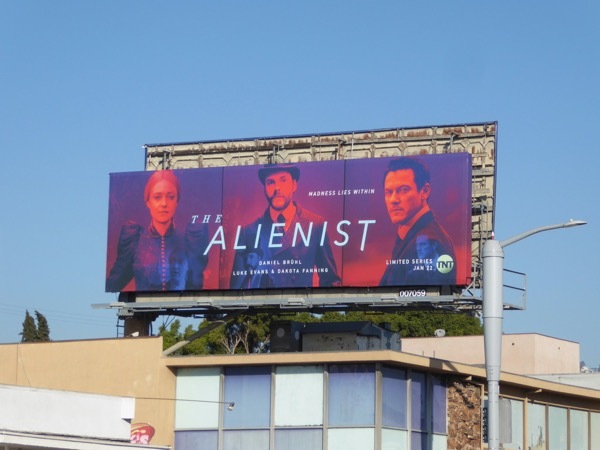 These 'For your Emmy consideration' billboards were spotted along Venice Boulevard and La Cienega Boulevard on June 2, 2018. 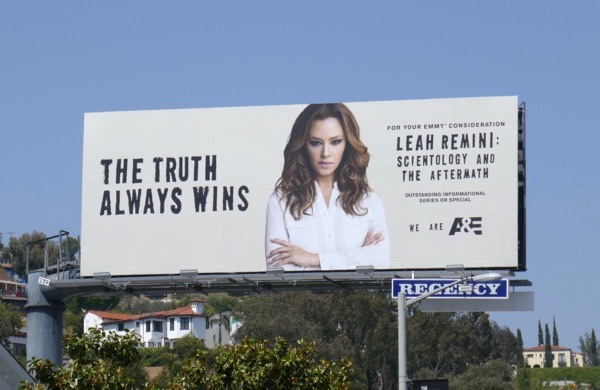 In the world of reality TV, Leah Remini was back for a sophomore season of Scientology and the Aftermath, exposing the truth behind the Hollywood cult and giving voice to the victims of the Church of Scientology. 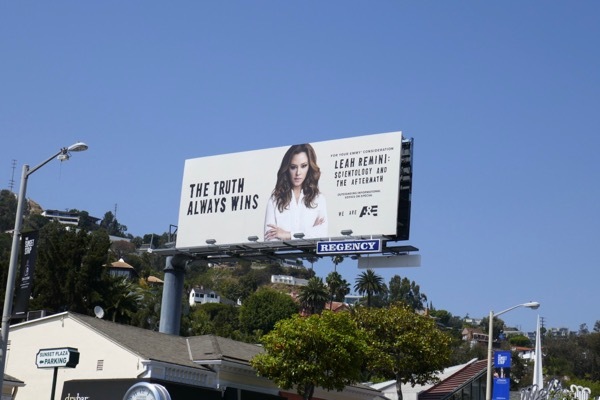 This A&E Emmy consideration billboard for season two was snapped above Sunset Plaza on June 7, 2018. Last year the documentary series took home the Emmy for Outstanding Informational Series or Special, can it repeat that success this year? 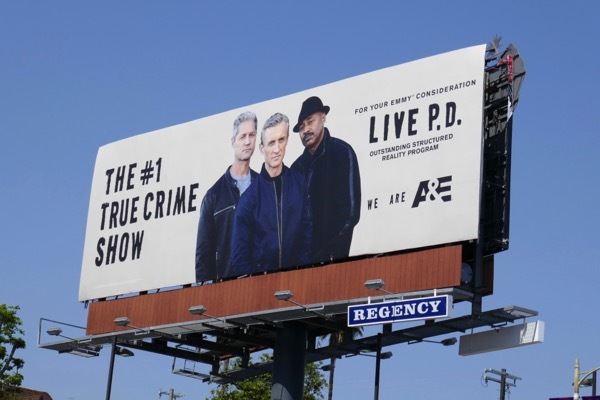 A&E was also giving some Emmy support to their law enforcement reality show, Live P.D., which follows police officers on their nighttime patrols across the country, hosted by Dan Abrams. 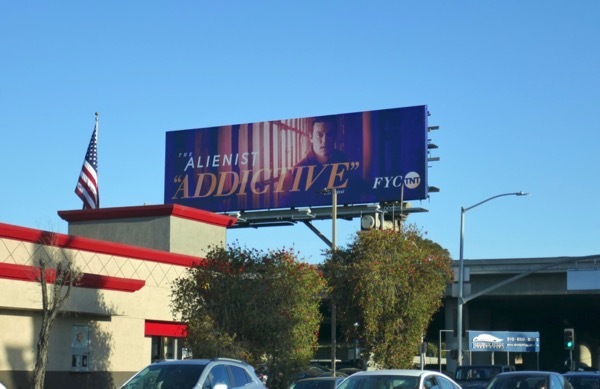 This cohesive Emmy FYC for the sophomore season was snapped along Sunset Boulevard on June 7, 2018. 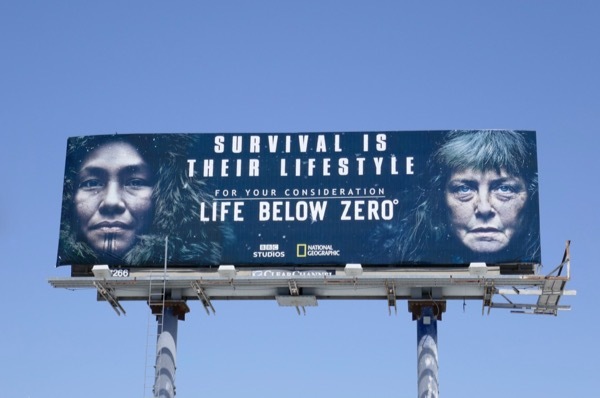 And finally for this selection, National Geographic's Life Below Zero was also up for consideration, now in its ninth season. 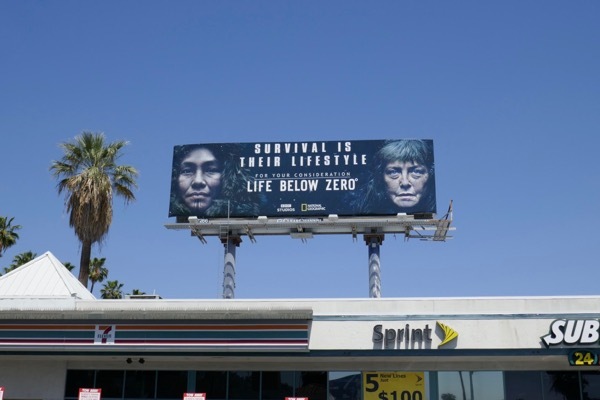 This Emmy consideration billboard for the documentary show that follows people living in remote parts of Alaska struggling to survive in the harsh conditions was spotted along the sunnier Sunset Boulevard on June 8, 2018. 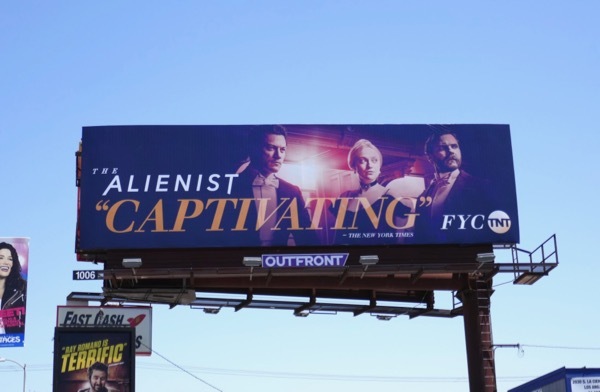 If you enjoyed this varied collection of Emmy campaign billboards, you can also check out this year's Netflix Emmy FYC billboards, these HBO Emmy FYC billboards and NBC's Consider Emmy billboards and more besides. Plus stay tuned this coming week for a look at the comedy series and sketch shows hoping for some Emmy attention this season. 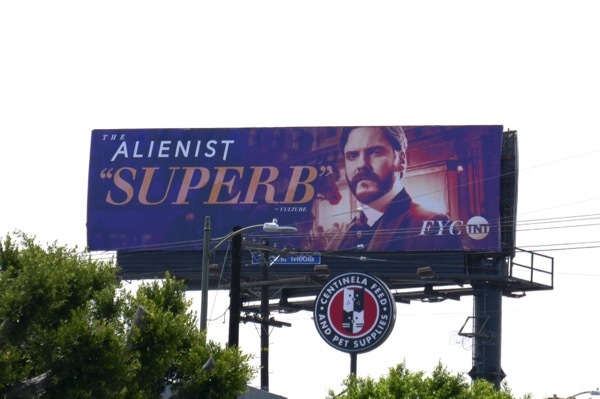 UPDATED: Here's another Emmy FYC billboard for The Alienist featuring Luke Evans, spotted above La Cienega Boulevard on June 13, 2018. 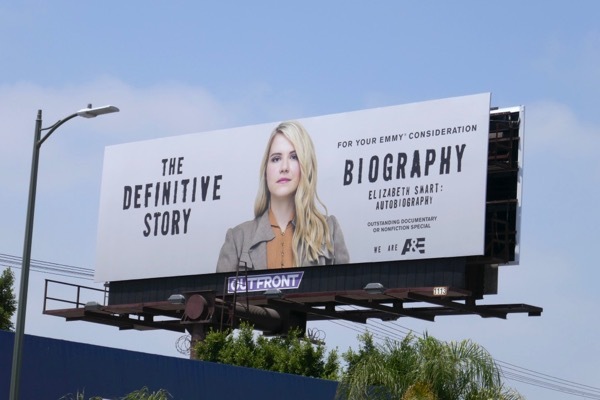 UPDATED: Here's also an Emmy consideration billboard for A&E's Biography the Elizabeth Smart: Autobiography about her abduction from her bedroom in 2002 and her nine months in captivity, spotted along Pico Boulevard on June 21, 2018. 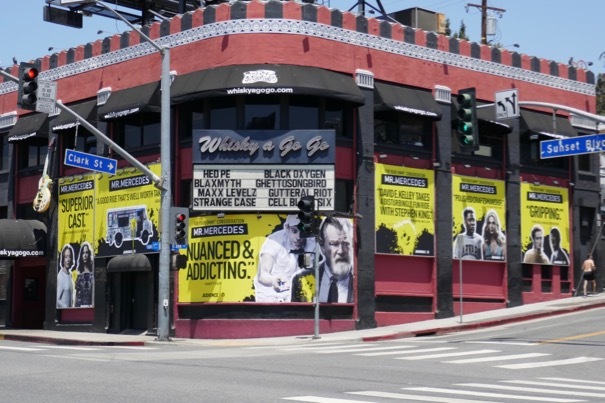 UPDATED: Here's also some Emmy consideration billboards for the Audience adaptation of Stephen King's Mr. Mercedes, snapped on the sides of the Whisky A Go-Go venue on June 30, 2018. 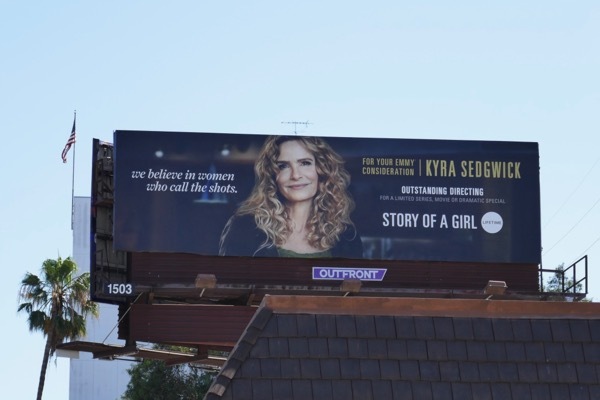 UPDATED: Here's also an Emmy consideration billboard for Lifetime's TV movie, Story of a Girl, directed by Kyra Sedgwick, spotted along Venice Boulevard on July 22, 2018.